Men and women alike can keep their toes nice and warm with the help of these Sepia Tone Crocheted Slippers. Great for beginners and advanced crocheters alike, these slippers are cozy and comfy to wear year round. You can easily make them in any color combination you'd like, and they also make great gifts and stocking stuffers for the holidays. 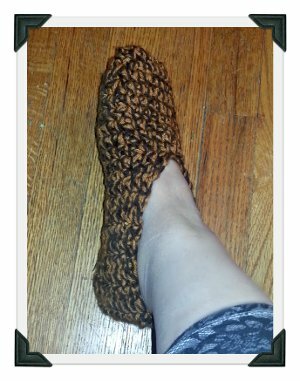 There's nothing like a handmade gift, and with these Sepia Tone Crocheted Slippers, you're sure to create something that everyone will cherish and appreciate for years to come. The rest of the slipper will be worked in rows. Hold the toe so that there are 10 stitches on each side and one stitch on each end. Join the yarns 4 stitches from the left edge. Break yarns and fasten off. For ballet style, end here. Weave in ends and they’re ready to wear. Fasten off and weave in.